Dirt, gravel, and low volume roads (low-traffic) roads transverse all of our rural landscapes from forests to farmlands. These roads frequently cut across natural drainage patterns to intercept both overland and sub-surface water flows and convey runoff directly to nearby streams, resulting in sediment pollution, an increase in flood flows, and a decrease in groundwater recharge through infiltration. 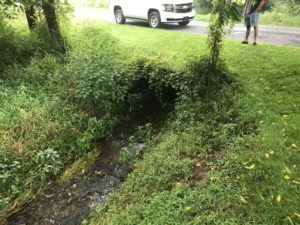 The combined “rural storm-water system” is a large, but frequently overlooked cause of stream and watershed degradation and impairment. 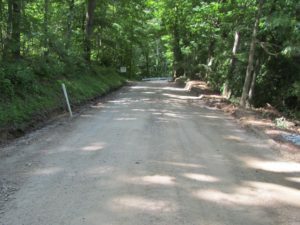 York County’s Dirt, Gravel, and Low Volume Road Program is available to eligible public road maintenance entities providing both financial and technical assistance. Better roads, better streams, better communities! Sediment is the largest pollutant by volume to the waters of the commonwealth. 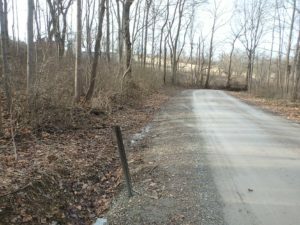 Pennsylvania’s 20,000 miles of publicly owned unpaved roads are a prime example of nonpoint source pollution. 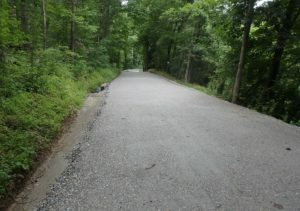 Unpaved roads not only generate sediment, but also act as collectors for runoff and sediment from adjacent land uses. Traditional practice in road maintenance has been to convey water along roads and deposit it into streams by the quickest means possible. This practice results in increased flood flows in streams and transports sediment and a host of other pollutants into local waterways. 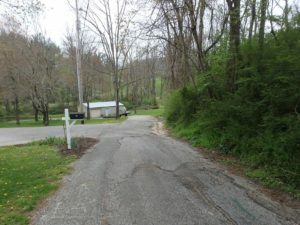 Act 89 of 2013 defines low-volume roads as “sealed or paved with an average daily traffic count of 500 vehicles or less.” The low-volume road portion of the Program focuses on the same environmental improvements as the Dirt and Gravel Road portion, not just paving and repaving roads. 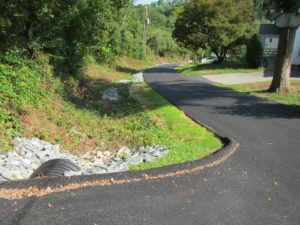 Many of the Environmentally Sensitive Maintenance (ESM) Practices advocated by the Center for Dirt & Gravel (D&G) Road Studies, Penn State University, are designed to “disconnect the rural storm-water system” to reduce sediment pollution, encourage infiltration, and reduce long-term maintenance cost. Reduce effects of concentrated drainage. Reduce maintenance cost and frequency. 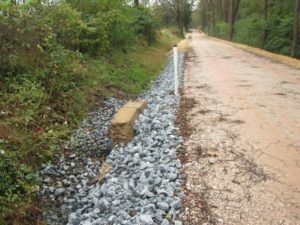 Local, county and state entities that maintain dirt and gravel roads are eligible to receive funding. 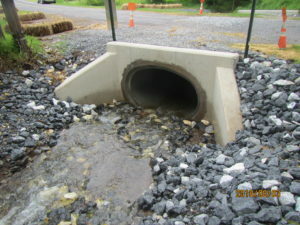 Entities successful completion of required 2-day Environmentally Sensitive Maintenance (ESM) training, are eligible to apply to the York County Conservation District for maintenance funds to address identified, priority pollution problems using environmentally sound practices. Eligible entities, with assistance of their County Conservation District, submit a 1-page application and work plan to address a specific verified worksite. Environmentally sound maintenance practices and approved products are used to correct pollution problems related to roadway. Grants awarded to successful applicants provide advance payments to aid with project cash flow and complete project work on a timely basis. Paperwork requirements are minimal. Local decision-making based on locally-defined goals is emphasized. The Center’s Environmentally Sensitive Maintenance (ESM) Course is an intense two-day classroom session focused on providing the knowledge and tools necessary for road owners to maintain roads in a more cost-efficient and environmentally sensitive manner. The Center holds approximately 10 ESM courses at locations around Pennsylvania every year. The course runs from 8 am to 4 pm for two days (doors open at 7 am for registration, continental breakfast and lunch included). 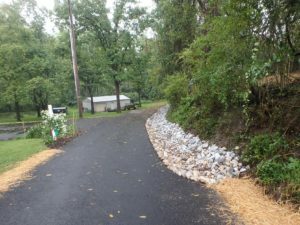 The course is free to municipal, county, and state agencies involved with PA’s Dirt and Gravel Road Program. All out-of-state and private companies must pay a fee of $395. This course provides 1.3 Continuing Education Units and 13 Professional Development Hours from the PSU College of Engineering. The closest training to York County will be on May 21st & 22nd at the Penn State Mont Alto Multi-Purpose Activities Center. Click the above link for more info and all other training locations being offered. 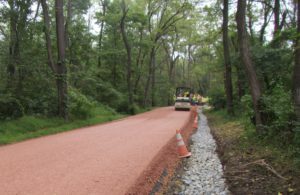 Potential Grant Applicants: In order to be eligible to apply for Program funds, the person in charge of work plan development and project implementation from the road-owning entity must have attended environmentally sensitive maintenance (ESM) training within the past five (5) calendar years. This training, and all past 2-day ESM trainings, count as eligibility to apply for BOTH Dirt and Gravel and Low Volume Road funds for a period of five (5) calendar years. NO MAILED IN REGISTRATIONS! A LIMITED NUMBER OF OPENINGS ARE AVAILABLE: PLEASE REGISTER ON-LINE AS SOON AS POSSIBLE. Registration will be closed 3 days prior to the scheduled program.